I have recently shared information about 20 blue chip stocks that gave more than 100% return in 2013. In this post I will be sharing information about 12 blue chip stocks suggested by Amar Ambani of India Infoline. 2013 was very good year for stock market. Sensex gave return of 44% during past one year. It is believed that sensex will continue to grow in 2015. With this belief India Infoline has identified 12 blue chip stocks which are extremely attractive even at current market levels. Each of these 12 blue chip stocks can potentially deliver 35-45% returns over period of two years. So here is 12 blue chip stocks by India Infoline. Having these large companies in your portfolio will make its risk profile more palatable without diluting the return potential materially. More over selection given above will make your portfolio diversified as stocks are from different sectors Auto,Banking, Pharma , Capital Goods etc. These stocks are with strong managements, advantageous competitive position, high earnings growth visibility, better corporate governance and relatively attractive valuation. 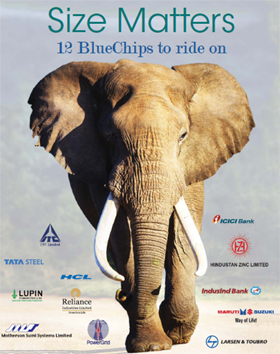 You can download Full report on 12 Blue chip Stocks from here. 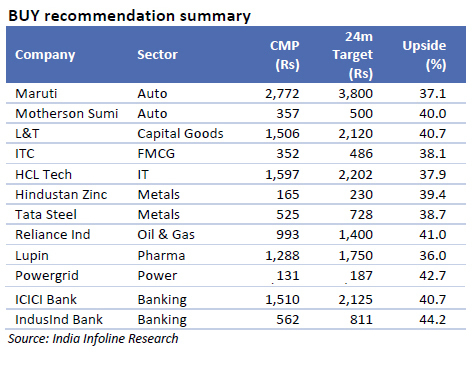 Do share your views on these blue chip stocks. « A Second Income Source how and why? Take a look at Piramal Ent. is a promising company with 19% ROE and from my point of view 20-30% upside for the stock price even at 19x EV/EBITDA valuation. Warburg Pincus – one of the biggest and most experienced PE funds – is still a long term investor in the company.